Earn an Income Doing What You Love! Then check out my 120+ page ebook with everything you need to know to start, run and succeed at your own private ESL tutoring practice. Do I have the qualifications to tutor ESL students? How much should I charge students? What can I do about cancellations and "no-shows?" Where should I conduct my lessons? Should I specialize in a particular topic area? How can I earn the most money doing what I love? In my book, "10 Steps to a Successful Tutoring Business," I answer these questions and more. I've put everything you need to know about starting and running your own tutoring practice into this book. And if you have a question I haven't answered, please contact me and I will personally do my best to give you the answer. This book is for anyone who wants to privately tutor English Language Learners and earn a living doing so. Whether you are just starting out, or have been teaching or tutoring for years, this book will help you be more financially successful doing what you love. It is for teachers and tutors who are offering, or would like to offer, private lessons to individuals or small groups. It is especially for those tutors and teachers, or potential tutors, who are open to the idea that a private tutoring practice will be infinitely more successful when it is run as a business. But don't be deterred by the idea of running your tutoring practice as a business. I've made every effort possible to clearly and succinctly describe in this book the simple policies, procedures, and practices you can implement to have a successful tutoring business that will enable you to earn a living doing what you love for a very long time. Please note that this book is not a grammar book or a textbook for use to teach English. It is a book about successfully starting and running a private tutoring business. I've laid out in detail everything you need to know to start and run a successful ESL tutoring practice; whether you want to tutor students one-on-one, in small groups, adults, children, immigrants, professionals, etc., you will find everything you need to start and run your tutoring practice here. This book is a culmination of my 10+ years experience of successfully tutoring English Language Learners in the U.S. for over 10 years. You can see the 10 steps and a complete Table of Contents of the book by clicking this link: Table of Contents. The book costs $37(USD) and is available for immediate download. You will likely earn this back in just one private ESL lesson! This is a "digital" book. You can download it to your computer and print it out whenever you want. There is no "hard copy." Important: After you check out on PayPal, you'll either be automatically brought to my site and the download page (if you use your PayPal account) or you'll see my name (Debra M. Garcia) on the PayPal receipt page that pops up (if you pay by debit/credit card). Click on my name and it will take you to the download page. If you have any questions, contact me and I will personally help you and make sure all your questions are answered. I only want you to have my book if it serves you. If it does not serve you, ask for a refund within 30 days of purchase and I will return 100% of your money. Please contact me with any questions you might have. I look forward to hearing from you! I wanted to let you know how helpful your book has been. I have all the content, education, and teaching experience I need, but your book has added a new dimension. It's really the "missing link" for me in terms of thinking in a clear and systematic way about expanding my tutoring business. Even one of my sisters, who is deaf and tutors ASL, was excited to see the contract & needs assessment documents as she'd been thinking that she would need something similar to clarify her terms. I might add that your warmheartedness and generosity shine through on your videos, emails, and all that you've offered via your website. 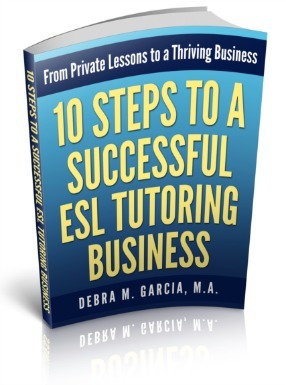 Debra Garcia and her website were a huge help to me when I first became a private ESL tutor in 2008. Prior to that I had taught classes of adults in a community based ESL program but didn't have experience with tutoring privately. Finding her website on the internet was a great relief to me as I was getting started. And Debra was also helpful in personally answering additional questions I had. Her website and ideas gave me the confidence I needed to start, and I have been tutoring steadily since 2008. I also have recommended her site to other people getting started in the business. It's SO helpful. Thank you! Throughout my TESOL study, I was constantly trying to connect the dots between what I was learning and how to apply it in a tutoring context. Then I found your website, which I devoured. You connected the dots for me ... the resources to use, the learning strategies to apply, the problems to avoid. It is impossible for me to thank you enough for your help. These materials are a backstop for teaching in small group voluntary situations. I have recommended them to many enthusiastic beginning tutors. Thank you. I was asked to take over the local Adult Ed. ESL class in April when the regular teacher moved out of the area. Even though I have worked with children for the last 17 years, I had no clue where to start with adults! I was shocked at how little my students were able to speak English after the time that they had in class. After doing multiple searches, I found your site and it was a life saver. The lessons are easy to follow and my students are speaking conversationally. Your site has great info and help for new teachers. I am a new TEL teacher and your website is a valuable addition to my learning. Your teaching tips newsletter always seems to arrive just when I need it and contain what I've been looking for to provide the best for my students. As I'm still a relatively new tutor and I don't do paid teaching it's an invaluable resource and it comes to me without me having to seek through all the other uncontrolled stuff that swamps the ESL world these days. Thank you! I really appreciate the fact that you are working hard to add more and more tips and resources all the time. When I receive emails from you, I feel like you are talking directly to me! I teach adults, so I am thrilled that you have suggestions and materials for adults! Thanks for the cool links, too. Your site has helped me immensely. It has given me the tools I need to create effective learning experiences for my students. Thank you. Thank you for your gracious gift of the "ESL worksheets for Adults" book online. I was so happy to find a whole book of exercises, and they were even organized in a table of contents. Usually online I just find one sheet here and another one there, etc. Thank you for sharing so freely. I appreciate it! Thank you for site! I am an English teacher at a high school in Puerto Rico. It is wonderful to be able to use your worksheets and adapt them to my students level of reading and writing! Thank you for helping me! Thanks for your great website. It is loaded with information that makes it a lot easier for me to prepare for my classes. As a person who is starting a new career as an ESL teacher, I am thankful that instead of "reinventing the wheel," I can use your book and prepare good lessons in less time. I am impressed that you would take the time out of your busy day to write all this up to help other teachers for free. The lessons are so helpful to me, and so well thought out and comprehensive. They make handy classroom cheat sheets for the teacher. Thank you very much for your time assistance. Great to have found another wealth of information for ESL. You have obviously invested the depth and scope of your own experience into your website and worksheets. Your knowledge truly shows and I am deeply grateful for your generosity in sharing your hard earned resources with those of us starting out. Very helpful site to which I referred during my IDELT certification process. I'll use the site even more frequently once I start teaching. Thank you for your creative ideas and optimism that make me stand up, go ahead and do something new with my beloved students! Your website is a complete guide for me, full of resources and worksheets. Though I'm very weak in grammatical tenses, your site has helped me immensely. Thank you. With dozens of web sources for lessons, I found your worksheets and lesson tips to be the most practical for beginning students. I have taught for years around the world in language schools through universities--and now with my interest in teaching or tutoring online as well as face to face, I appreciate your well-designed lessons. I have successfully used your website materials to tutor ESL students. Thanks so much! Thank you Debra for taking the leap and inspiring us all to venture in another world of simplicity and support. I have had an insight outlook on how and not why to Teach English in any capacity. Even the current First Language English speaking learner can transform learning in a fun way. I've been trying to become an ESL teacher for years, but what has really helped me overall are all the tips and worksheets you provide in your page! I just "discovered" you website and love your work with the ESL Adult Worksheets. Thanks for sharing! Great job Debra!! This has helped me as I try to help Hispanic learn English. Your website is great! I am a volunteer tutor in my hometown and your worksheets and tips have really helped me out a lot! The site and the resources are almost never ending and every time I see something different in the material. I really appreciate this space of ideas, knowledge and resources on ESL. The importance of such an environment is top notch for us teachers. No more distance shall keep me from getting and exchanging valuable info on how to work different classroom situations. Outstanding initiative! Disclaimer: The information in this book is provided for general information purposes and does not constitute legal, financial, or accounting advice. I cannot and do not accept any responsibility for any loss which may arise from reliance on the information contained in this book, my website, or my blog. And, of course, I cannot guarantee how much money you can or will earn or that you will earn any money at all. Amounts mentioned in this book are for illustrative purposes only and are not a guarantee of income.